Passengers rolling into Union Station have a new place to enjoy drinks and bites with the opening of 213 Hospitality’s Imperial Western Beer Co. and adjacent cocktail lounge The Streamliner. The space they take over is an old one, dating back to a railroad restaurant chain once so famous that MGM cast Judy Garland in a musical about its employees. But that was then. 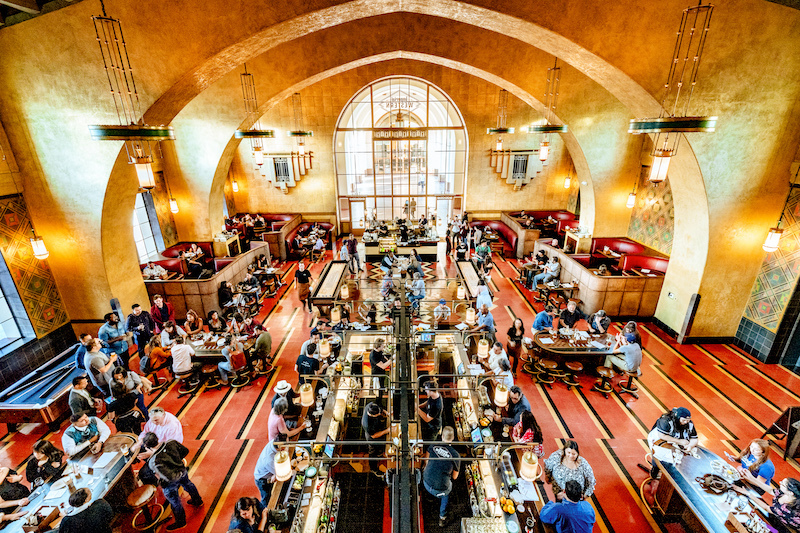 Today, the employees might not be appearing as characters in studio pictures, but the nods to history are everywhere, the beer flows daily, and the throwback decor makes for one heck of a hangout spot in DTLA’s busiest transit hub. In the mid-1800s, a teenager named Fred Harvey moved from England to the United States where he quickly found work in New York restaurants. His first attempt to own a restaurant came several years later in St. Louis, but Harvey lost everything after he and his business partner got into an argument over the Civil War. Harvey sided with the North; his partner took all their money and went to fight for the Confederacy, leaving Harvey broke. Harvey eventually found work in the railroad business, which gave him firsthand knowledge of the meager food offerings rail travelers endured in the American West. Trains west of Chicago had no dining cars to speak of. Instead they stopped at “eating houses” every 100 miles, where travelers could subsist, if they could actually stomach the food, that is. This is how Harvey got the idea to start what would become America’s first chain restaurant, a place where passengers could expect a reliable, quality meal every time. He opened his first Harvey House restaurant at the AT&SF railway depot in Topeka in 1876, then several more as the line expanded. The first Los Angeles outpost opened in 1893 at La Grande Station, which is where you’ll find the One Santa Fe development the Arts District today. 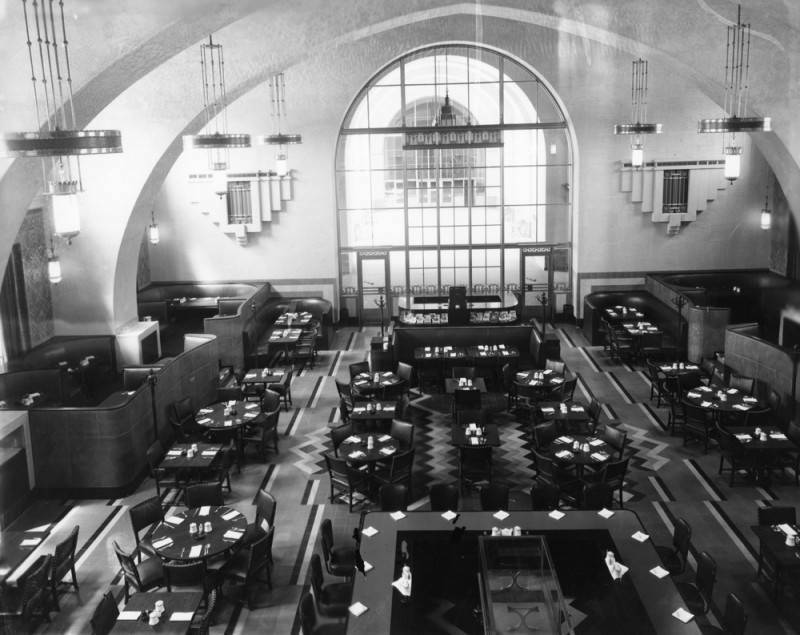 When Union Station was built in 1939, it included a Harvey House that could accommodate up to 300 diners at a time. It wasn’t just the food that adhered to strict guidelines across the Harvey restaurants, but the employees as well. Customers were served by an all-female staff, ages 18 to 30, known as Harvey girls. They lived in work-adjacent housing, had strict curfews of 10 p.m., and were not allowed to get married until they’d worked at least one year. Richard Melzer, author of Fred Harvey Houses of the Southwest, notes that most Harvey girls were white, at least until after WWII. The women wore demure outfits with high collars and long skirts, and were the subject of both a 1942 novel by Samuel Hopkins Adams and a 1946 MGM musical adaptation starring Judy Garland (by today’s entertainment standards, it does not seem even a little progressive). Union Station’s Harvey House was designed by Mary Elizabeth Jane Colter, who served as the Fred Harvey Company’s interior designer and architect. It boasts a tiled floor meant to look like a Navajo rug, towering ceilings, and a striking balcony that overlooks the cavernous space. 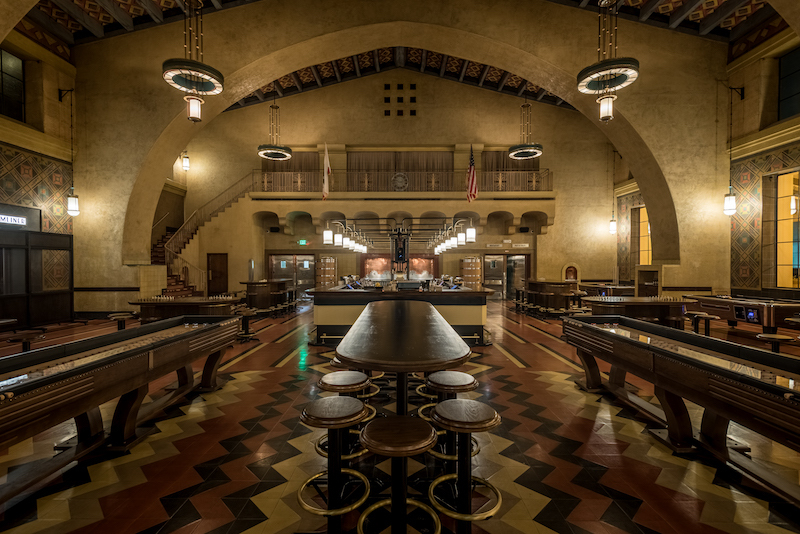 The company also ran a soda fountain, newsstand, barbershop, and shoeshine, according to the book Los Angeles Union Station. The restaurant itself closed in 1967, as train travel diminished in popularity. According to the Los Angeles Times, the vacant restaurant transitioned to a private event space and filming location. Jeff Cooper, a locations manager, told the Times that this is where Steve Buscemi’s character is shot and falls backwards from a balcony in the 2005 dystopian sci-fi flick The Island. “You should have seen the dummy they used for him. It was so realistic you’d ask it for an autograph,” he said. 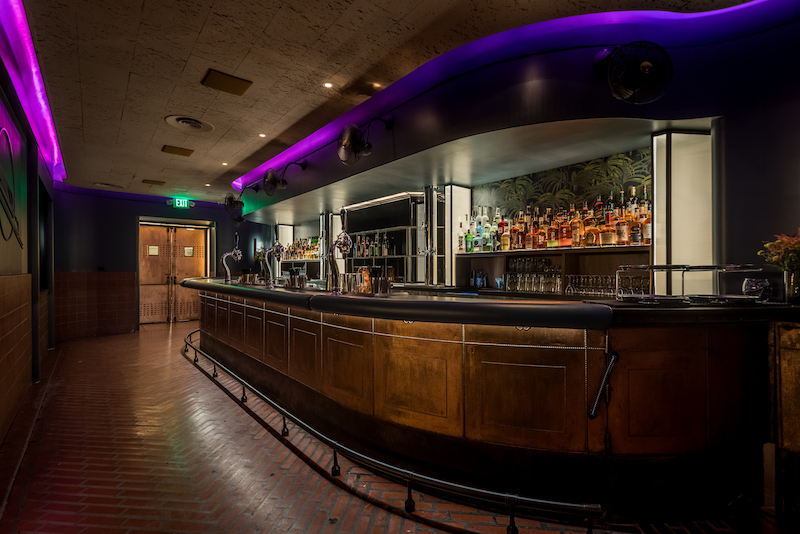 Today, the space retains the glory of the original after a meticulous, four-year revamp from 213 Hospitality (The Varnish, Seven Grand, Normandie Club), during which 213 Proprietor Cedd Moses said the company worked with both L.A. Metro and the Los Angeles Conservancy. Much of the decor—including the floor, light fixtures, entrance and sign, and parrot-themed tile work near The Streamliner—is original. According to Brewery Manager Bryan Garcia, the balcony’s railing is a replica recreated from old blueprints, as the original was, at some point, stolen. Imperial Western Beer Company, named after a Southern Pacific train, is ideal for a post-work beer or a casual meal while waiting for a bus or train. There are two bars, and you’ll find plenty of seating at either main-floor tables or booths tucked away in the corners. Those looking to kill some time can enjoy their many game tables, which include pool, shuffleboard, and chess. There’s also a small back bar servicing an outdoor patio, near where the brewery’s many tanks are located. The menu comes courtesy of Chef David Lentz (Hungry Cat) and offers a solid list of American staples, including buttermilk fried chicken, pork ribs, and a rich burger with gruyere and bacon. But the bulk of the menu leans towards seafood, with fresh or grilled oysters, a ceviche of the day, fish tacos, and clam chowder. A $1 oyster happy hour is available on weekdays from 4 to 7 p.m., while brunch is served on weekends from noon to 3 p.m. Beers comes via Devon Randall (formerly of Pizza Port, Lost Abbey, and Arts District Brewing), and is split into categories like “Light & Refreshing” and “Dark & Broody.” There are some interesting brews in the mix, alongside the IPAs and pale ales. There’s the Fordie, a smooth, dark mild which you can order brewed with coffee and on nitro, or decaf. It’s presumably named for Fred Harvey’s son, Ford. The Le Grande is a stout brewed with West coast oysters, while Bells & Whistles is a very peachy sour. Expect around 19 or so brews at a time, with choices rotating often. For something a little stronger, The Streamliner is the adjacent dark and cozy cocktail bar, offering an uncomplicated menu of classic cocktails, including martinis, Tom Collins, and an Old Fashioned. The emphasis here is on making the affordable cocktails with efficiency (not unlike 213’s Slipper Clutch bar downtown), and you can expect to pay $7 to $9 for a drink. The bar is standing room only, but booths—featuring original amber bubble glass and curved walls in the Streamline Moderne style—extend down a long narrow hall reminiscent of a train car. The cocktail lounge opens daily at 4:47 p.m., a time selected for The Streamliner trains’ former schedules. Imperial Western Beer Company and The Streamliner are located at 800 N. Alameda St. at Union Station.